Ivan Franco Capelli (born 24 May 1963, in Milan) is an Italian former Formula One driver. He participated in 98 Grands Prix, debuting on 6 October 1985. He achieved three podiums, and scored a total of 31 championship points. From 1997 until 2018 he was a Formula One commentator on the Italian TV station Rai 1. Capelli began his career as a kart driver when he was 15 years old, and after four years he moved to the Italian Formula Three Championship. In 1983 he became Italian Formula Three champion, after dominating the series with nine victories. After that he moved with the Coloni team to the European Formula Three Championship, and here he was the champion again in 1984. In 1985 he graduated to the European Formula 3000 Championship with a Genoa Racing March-Cosworth and won one race. The same year he debuted in Formula One, driving a Tyrrell at the European Grand Prix (despite never having driven at Brands Hatch before), and finished fourth in Australia. Nevertheless, he was not picked up for a full-time Formula One drive in 1986. Instead, he contested the 1986 Formula 3000 Championship, still with Genoa Racing, and also raced a BMW in the European Touring Car Championship. Despite not landing a full-time contract for 1986, Capelli started several F1 races for the AGS team. Meanwhile, Cesare Gariboldi, boss of Genoa Racing, was working with Robin Herd of March to create a new Formula One outfit. Capelli was a core component in their plans. By now, Capelli and Gariboldi had an almost father-son relationship. Capelli driving for March at the 1988 Canadian Grand Prix. Capelli driving for Leyton House at the 1991 United States Grand Prix. In 1987 Capelli was in Formula One full-time with the March team, led by Gariboldi and running Herd's new chassis with a Cosworth V8 normally aspirated engine. Capelli also continued with BMW touring cars for the Schnitzer team, as the March budget was tight (so much that they raced at the Belgian Grand Prix with a detuned 3.3 litre sports car engine rather than the full 3.5l Formula One unit), and the Schnitzer team had works status with BMW, allowing him to be on the German company's payroll. Capelli scored March's first point with sixth at the Monaco Grand Prix and March's return to Formula One was generally seen as competent, professional and promising for the future. In 1988 Capelli had a new weapon, a March chassis designed by Adrian Newey (later famed as a designer at Williams, McLaren and Red Bull) combined with a Judd V8 engine (derived from the Brabham-Honda CART engine and the Judd/Honda F3000 unit). March had hoped to be the favoured development partner for this engine, but they found themselves sharing it with the French Ligier team as well as the defending F1 Constructors' Champions Williams who had lost their supply of turbocharged Honda engines to McLaren. Capelli was joined in the team by the British Formula 3 Champion, Brazilian rookie Maurício Gugelmin. They made a strong team and the March 881 was the surprise of the year. At Spa-Francorchamps he scored his first podium with a third place behind Ayrton Senna's and Alain Prost's McLarens (though this was not known until after the season when the Benetton's were disqualified for fuel irregularities). Capelli's best finish was second place at the Portuguese Grand Prix where he finished behind Prost. Ever respectful, Capelli even referred to the then dual World Champion as "The great Mr Prost" in post race interviews. Even better was ahead for the Italian when he became the first non-turbo driver since 1983 to lead a World Championship Grand Prix. This happened on lap 16 of the Japanese Grand Prix at Suzuka when Prost missed a gear coming out of the final chicane and Capelli was able to get ahead before the start/finish line and officially lead the lap. However, Prost used Honda's superior power and was ahead before turn 1. Unfortunately his Judd V8 suffered electrical failure just 3 laps later. However, the momentum did not continue. March had financial problems and a sponsor, Leyton House, acquired a controlling interest. Gugelmin finished third in his home race at Jacarepaguá in 1989, but this was done in the 1988 car. The definitive 1989 Leyton House March was a disappointment, and neither driver challenged for the top in the rest of the year. Capelli in particular seemed destined not to finish races in 1989. In fact, he only finished once (12th in Belgium) and went on one further occasion far enough to be classified (Monaco where he dropped out from 6th place near the end and was classified 11th). Despite this Capelli was actually one of only six drivers to start in all of the 16 races of the 1989 season (the others were the McLaren drivers Ayrton Senna and Alain Prost, the Williams duo Riccardo Patrese and Thierry Boutsen, and Benetton's Alessandro Nannini). 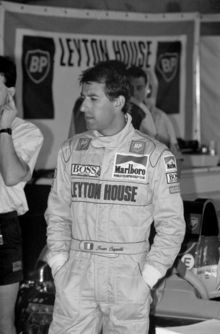 Team spirit remained intact despite the death of Gariboldi in a car crash and midway through the season Capelli felt happy enough in the team to take up his option for 1990. The new decade started like 1989 though. Newey's car (given the prefix CG in honour of Gariboldi) had excellent aerodynamics and exclusive use of Judd's updated V8 engine, but it was intolerant of bumps. It was so bad on the notoriously bumpy Mexico City track that neither driver could control the car and both failed to qualify. Nevertheless, in the next at Paul Ricard in France came a complete turn around in form. Capelli led Gugelmin in a Leyton House 1–2 throughout much of the race. Gugelmin finally retired, and Capelli was overtaken near the end by the Ferrari of Prost with only 3 laps remaining and went on to finish a strong second. Revisions to the car had made it more competitive (ironically Newey left the team shortly before the race to join Williams), but it was the billiard table-smooth track which allowed the result. Despite some promising showings at Silverstone and Hockenheim, the remainder of the year was unfulfilled. Capelli in the cockpit of his Leyton House for the 1991 United States Grand Prix. In 1991, Leyton House was responsible not only for chassis development but also bankrolled the ambitious Ilmor V10 engine programme. With so many new ingredients, results were again thin on the ground although Capelli often qualified and raced well. When Leyton House's owner Akira Akagi was arrested in connection with the Fuji Bank fraud, the team was in a precarious state. Capelli had signed for Scuderia Ferrari for the '92 season, so he voluntarily stepped down, allowing pay driver Karl Wendlinger to finish the season and personally paid to attend the races he missed to offer support to the team and advice to his rookie substitute. In 1992, Capelli became the first Italian with a regular drive with Ferrari since Michele Alboreto in 1988, after Gianni Morbidelli's one-off race for the team the season before. The Scuderia had gone through a tough time in 1991, but with a new car, the F92A, expectations were high. The new car was not competitive and before the season began Capelli was showing his disappointment. A driver who enjoyed the convivial atmosphere of a family-type team, he struggled to integrate with the bureaucratic structure of early 1990s Ferrari. Losing motivation, the team in turn lost confidence in him and his teammate Jean Alesi gained the upper hand. Capelli was sacked before the season's end. This experience seemingly broke his spirit, but those who had worked with him at March still had faith, notably Ian Phillips, then Jordan team manager. Taking a Jordan seat for 1993 alongside a young Rubens Barrichello, whom the team hoped would prosper under the more experienced driver, Capelli failed to rediscover the spark that not long ago had marked him as a champion of the future. After failing to qualify for the second race in Brazil, he left the team by mutual consent, being replaced by Thierry Boutsen. Capelli was distraught and Jordan was disappointed too – they knew Capelli had the ability, but he just couldn't muster it up any longer. His Formula One career was over. Following his exit from Formula One, Capelli raced from 1994 to 1996 with a Nissan Primera with mixed results in STW for BMS Scuderia Italia and in some round of CET in 1995 and 1996. He also became a Formula One commentator since 1997 on Italian TV station Rai 1 and remains a popular personality in the paddock. Having come to terms with the disappointment of the bitter ending of his Formula One career, he has regained the happy disposition which had originally made him popular. Wikimedia Commons has media related to Ivan Capelli. This page was last edited on 8 April 2019, at 15:57 (UTC).